Dr. Henriod thoroughly explains treatment options and answers any questions you may have. Overly exposed tooth roots not only flaw the aesthetics of your smile, they are often very sensitive to hot and cold temperatures. This condition can now be corrected with our minimally invasive gum grafting procedures. Dr. Henriod uses microsurgical techniques to gently cover the roots of your exposed roots, revitalize the aesthetics of your smile and put an end to root sensitivity. The patient’s previous gum recession is shown in the left image. After gum grafting (right) the patient’s gums are healthy and the roots are protected. Dr. Henriod is an expert in providing minimally invasive gum grafting treatment. Dr. Joel Henriod brings to our practice a wealth of knowledge regarding minimally invasive gum grafting. He is nationally renowned for his expertise with gum grafting procedures, and is sought after for lecturing and training other dentists. Additionally, he is the periodontist of choice for many dentists who refer patients for specialty treatment. Root surfaces are softer than tooth enamel and are more prone to erosion. This erosion causes sensitivity to heat, cold and sweets. Gums that are severely worn can fail to adequately support teeth, leading to breakage and tooth loss. Traditional gum graft surgery can be lengthy and uncomfortable. However, Dr. Henriod uses a minimally invasive, state-of-the-art procedure, known as microsurgery, to repair your gums quickly and comfortably. Microsurgery uses small instruments with illuminated microscopes. This means small incisions with far less suturing needed and far less discomfort post-treatment. Instead of cutting into the gum, our doctors create a small tunnel in the neck of the tooth to insert the gum graft. The most recent development in gum grafting for receding gums is the Pinhole Surgical Technique. With the pinhole technique, Dr. Henriod treats receding gums by shifting the gum tissue over the exposed roots through tiny pinholes, and then stabilizing the gums in position with collagen. No sutures are required, and your entire mouth can be treated in just one visit! Both the microsurgical procedure and Pinhole Surgical Technique are minimally invasive, and only require the use of local anesthesia. We do offer the option of sedation for longer treatments, and for patients who are anxious. There is no need for prescription medications after your procedure, although some patients opt to take over-the-counter painkillers for a few days. Using a minimally invasive procedure means there is minimal impact to your body. Conventional gum grafting requires the sacrifice of healthy gum tissue and can lead to further gum loss after healing. There is an additional cosmetic benefit: conventional surgery leaves a white patch that doesn’t blend aesthetically. With our minimally invasive techniques, your new gum is the same natural pink shade as the rest of your gums. Treatment varies according to which type of gum grafting is decided upon, but all treatment follows the basic steps below. With microsurgical gum grafting we can obtain the gum tissue we need the same day as the gum graft. (Traditional gum graft surgery requires a separate visit for tissue collection and a one- to two-week healing period.) In some cases we will use donated gum tissue or synthetic tissue, such as collagen in the Pinhole Surgical Technique. We use a special surgical microscope to view the inside of your mouth at up to 24 times magnification. This allows Dr. Henriod to use very small instruments and make tiny incisions. The surgical microscope also increases the field of vision, ensuring more accurate and successful surgery. Generally, we recommend treating the full mouth in two visits of two hours. If only a few teeth are affected, the patient should be in and out in about forty minutes. In certain situations we use plasma-rich growth factors (PRGF) from the patient’s own blood to boost healing. After treatment, most people take a couple of doses of over-the-counter pain medication for a day or two. 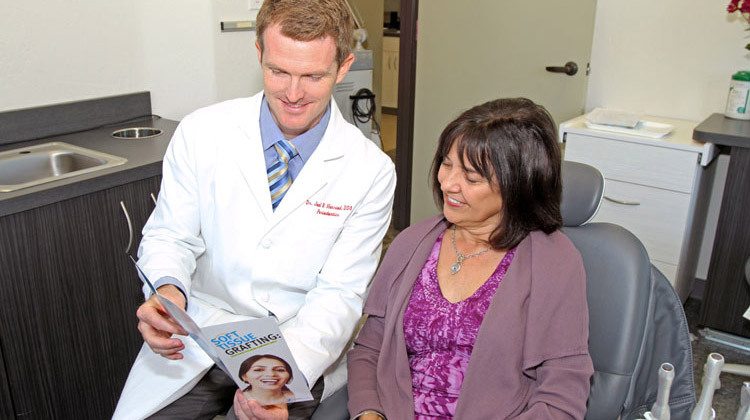 We like to see our patients for three follow-up visits over a period of three to six months.